B.C. 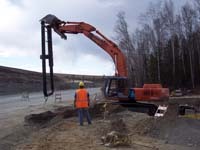 Excavating was the general contractor for the installation of a landfill gas collection system to burn Methane from the Anchorage Regional Landfill. B.C. 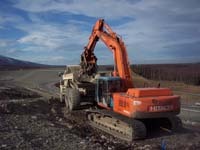 Excavating was able to complete the project on time under very tight time constraints. During the course of the project B.C. 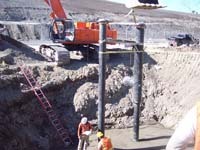 Excavating provided the client over $65,000.00 in savings through value engineering proposals. 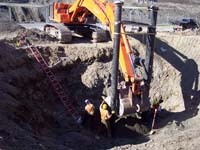 The project included installation of 14,000 lf of 4-18 inch HDPE piping around the landfill to transport landfill gas. The piping was tied into 50 vertical wells that were drilled onsite. Our subcontractor, Criterion General, constructed a 30-foot by 50-foot building to house the equipment to process the gas. Enterprise Engineering designed the foundation for B.C. Excavating on this project. A 45-foot flare was set up onsite for burning the landfill gas. In addition to the gas extraction system B.C. Excavating installed over 5,000-feet of perimeter trenching around the landfill to control stormwater runoff.